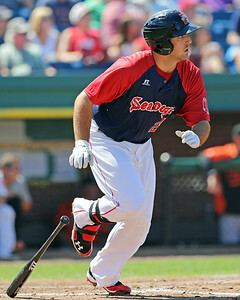 The week started off with Travis Shaw (pictured) being promoted to Pawtucket. The 24-year-old hit .305/.406/.548 this season in Portland, and he has hit .269/.345/.500 in his 26 at-bats with the PawSox. Shaw was one of several top prospects discussed in the most recent SoxProspects.com Podcast. Chris Hatfield, Ian Cundall, and Matt got together to discuss Shaw, Mookie Betts, Blake Swihart, Henry Owens, and Henry Ramos, with all of those players performing very well over the first two months of the season. Betts has transitioned almost full-time to center field, where he has started in eight out of the last nine games. In a piece for ESPNBoston.com, Hatfield talked with Betts about his transition to the new position, specifically the mental side of it. Alex Speier of WEEI.com talked about how patience has paid off with De La Rosa. After struggling in spring training, the Red Sox gave De La Rosa a long checklist of items to work on, and he made the necessary adjustments to put himself in position to help the big league club. ﻿Garin Cecchini (pictured) and Alex Hassan also moved up from Pawtucket, with both collecting their first major league hits on Sunday. As Brian MacPherson noted in the Providence Journal, Cecchini endeared himself to manager John Farrell by being one of the first players to arrive at Fenway on Sunday. He was only up for one day, as he was sent back down after the game. ﻿Hassan, who grew up in Milton, Mass. and played at Boston College High School, is Cecchini's roommate in Pawtucket, and the two have grown close over the past few months. 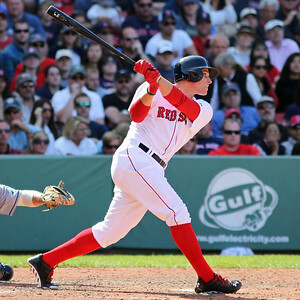 Joon Lee of WEEI.com discussed how the two have bonded over their major league dream. ﻿Lee also talked with Christian Vazquez about the most difficult adjustment from Triple-A to Double-A, and noted how Vazquez's development impacted how the Red Sox approached free agency last season. ﻿The big topic that will be discussed this week is the MLB First-Year Player Draft. SoxProspects.com Editor-in-Chief Mike Andrews released the first in his four-part Draft Preview series today, which gives you all the background you need on the upcoming Draft, including dates, times, and the draft order. ﻿Tim Britton of the Providence Journal detailed how the Red Sox are not scared to draft players coming off of an injury. Cecchini, Jackie Bradley, Jr., and Anthony Ranaudo are a few of the players the Red Sox drafted who may have slipped due to missed time because of injuries before being drafted. Four names in this year's draft to keep an eye on are Jeff Hoffman, Erick Fedde, Brandon Finnegan, and Derek Fisher. All are first-round talents who may fall due to injuries. In his Minor Details Podcast, Speier previewed the draft with Red Sox Amateur Scouting Director Amiel Sawdaye and MLB.com's Jim Callis. While they have been overshadowed a bit by the young players in Boston and the upcoming draft, Henry Owens and Allen Webster have been pitching very well. Owens has regained his control and walked three and struck out 11 in his last 14 innings without allowing a run, and Webster went eight innings on Friday, allowing one run while walking one and striking out seven. Owens talked with Kevin Thomas of the Portland Press Herald about how he is able to control the ball better and pitch deeper into games.